Yokneam, Israel – 17-November-2015 – CompuLab is introducing CL-SOM-iMX7 – a miniature, cost effective System-on-Module built around the recently announced Freescale i.MX7 System-on-Chip family. Rich and versatile feature-set makes CL-SOM-iMX7 a powerful platform for a wide range of industrial applications such as control and automation, point-of-sale devices, medical equipment and IoT gateways. CL-SOM-iMX7 has been designed to bring out the full I/O capabilities of the highly versatile i.MX7 SoC. Peripheral interfaces include PCIe, dual Gigabit Ethernet, 2 native USB ports, 7 UARTs, 2 CAN ports and 124 GPIOs. Display connectivity is supported with a parallel RGB port and MIPI-DSI. In addition, CL-SOM-iMX7 extends the native i.MX7 I/O even further with on-board 2.4GHz / 5GHz WiFi, Bluetooth 4.1, 3-port USB hub and LVDS display interface. Addressing the industry’s need to combine high-level O/S handling graphical UI and high-bandwidth I/O with real-time responsiveness, i.MX7 includes a Cortex-M4 MCU supporting real-time operation. Leveraging the i.MX7 multicore architecture, CL-SOM-iMX7 is an excellent solution for applications which traditionally required system designers to incorporate an additional MCU dedicated for real-time tasks. Featuring highly efficient 28nm Cortex-A7 cores and power-optimized PF3000 PMIC, CL-SOM-iMX7 delivers excellent power efficiency. Low power consumption and miniature size of only 42 x 68 x 5 mm make CL-SOM-iMX7 an ideal choice for portable and battery powered equipment. Industrial temperature range of -40° to 85° C allows CL-SOM-iMX7 to support operation in harsh environments and outdoor installations. CL-SOM-iMX7 is provided with a full BSP and ready-to-run images for the Linux operating system. The CL-SOM-iMX7 BSP includes Linux kernel 3.14, Yocto Project file-system and U-Boot boot-loader. In addition, CompuLab will support CL-SOM-iMX7 with mainline Linux and upstream Yocto Project. 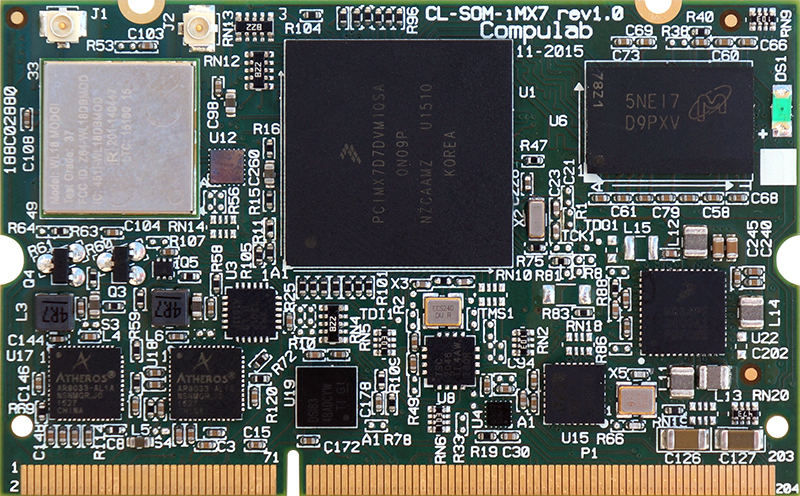 CompuLab supports CL-SOM-iMX7 with SB-SOM-iMX7 carrier board and EVAL-SOM-iMX7 evaluation kit enabling streamlined and rapid product development. 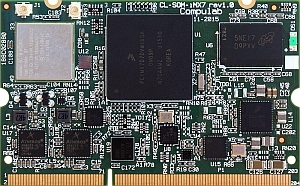 The SB-SOM-iMX7 carrier-board has been designed for CL-SOM-iMX7 evaluation as well as for deployment as an iMX7 single board computer. SB-SOM-iMX7 schematics and layout are can be used by CL-SOM-iMX7 customers as a reference design for a wide range of industrial use cases. The EVAL-SOM-iMX7 eval-kit offered at $275, includes CL-SOM-iMX7 and SB-SOM-iMX7 hardware set, LCD panel, cables and a technical support contract. CL-SOM-iMX7 will be available by end of February 2016 through CompuLab’s worldwide distribution channel and through direct sales (www.compulab.com). CL-SOM-iMX7 will be offered at a variety of configurations starting from $39 for volume orders. EVAL-SOM-iMX7 evaluation kit will be offered at $275. Detailed ordering and pricing information is available at CL-SOM-iMX7 product page. NOTE TO EDITORS: For additional info and high-res product images please refer to the CL-SOM-iMX7 press kit or visit www.compulab.com.